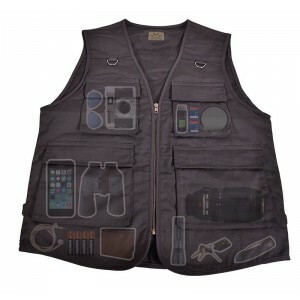 The On-the-Road Travel Vest is perfect for use as a Travel Vest, Fishing Vest, Hunting Vest, Hiking Vest, Bird Watching Vest, Rock Climbing Vest, Photography Vest, Concealed Carry Vest, Outdoor Activity Vest, and as an all around Utility Vest. Of the 14 extra deep pockets, 4 are Velcro, 2 have YKK zippers, 2 have clasps, and 6 have elastic to meet whatever your storage needs may be; 4 of the pockets measure over 8 inches deep. 2 D-rings are attached to the front, which conveniently hold fishing lures, glasses, pens, and other accessories. When placing your order, please FOLLOW THE SIZING CHART in our images as we have non-standard sizing. Keep protection within reach with Blue Stone Safety Products!